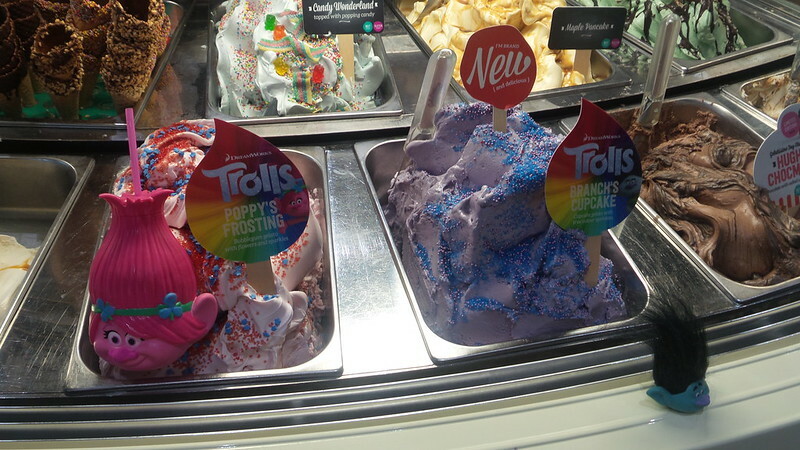 A couple of weeks ago I was invited up to Gelatissimo at Norwood to a gelato masterclass which also celebrated the launch of two limited edition Trolls flavours. For some reason, I’ve always been under the impression that gelato is non-dairy based (unlike ice cream). However, I have been wrong. Sorbet is water-based, gelato is milk and cream-based and ice cream may be milk and cream-based or it may be custard-based (in which case it also contains eggs). At Gelatissimo, the range also includes sorbets – so if you don’t eat dairy, you can still enjoy an icy treat. We started with a quick run down of the theory of making gelato, before being shown the ropes. 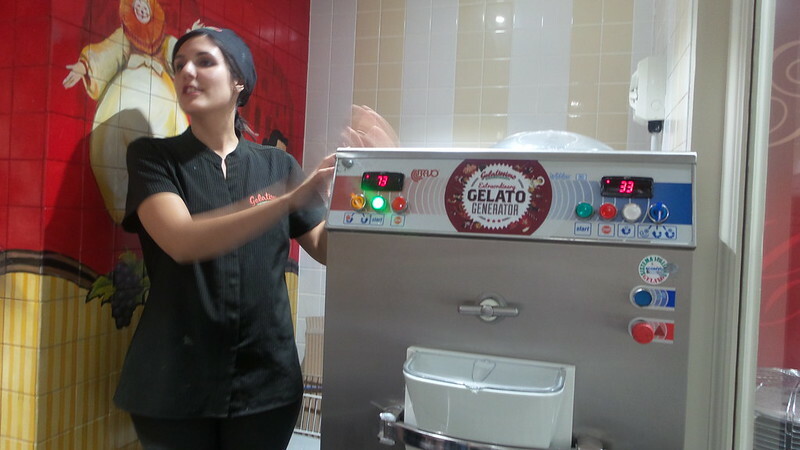 The Gelatissimo stores all make their product on-site and in the Norwood store, the action takes place behind a wide window, so you can get an idea yourself. Gelato is made by mixing the milk, cream and sugar at temperature (in order to dissolve the sugar) before cooling and adding flavourings. It is then churned at near freezing temperatures in order to both set the gelato and ensure there are no crystals. While gelato is hardly health food, Gelatissimo does keep one eye on nutrition and there’s an emphasis on using natural products. Despite its very scary purple appearance, the Trolls-inspired Branch’s Cupcake gelato is actually coloured with beetroot! Quite a few of the standard flavours use Stevia in lieu of extra sugar and where possible, natural flavourings and colourings are used. The great thing is that the staff in the Norwood store (at least) were across all of this, so you can quiz staff about their product and they will actually know. We sampled the two new flavours – Branch’s Cupcake and Poppy’s Frosting. I was really scared by the purple of Branch’s Cupcake (purple and blue are two colours foods are just not meant to be!) but I really enjoyed it. Not sure I can nail a flavour description for you – Gelatissimo describes it as ‘cupcake’ so I guess that kind of vanilla and cake batter vibe is what you should expect. I really wasn’t a fan of Poppy’s Frosting. It’s described as a bubblegum flavour but to me it was more along the lines of banana or banana sweets. As these are limited edition flavours, if you want to try them out you should do so during the school holidays. But never fear if you do miss out, as Gelatissimo has a very impressive range of flavours to choose from!